Norhtec is a company based in Thailand, distributing tiny PCs initially aimed for the embedded and industrially-deployed market. This tiny gem is called Microclient Jr, I will call it henceforth Junior for short. Pierce corporate firewalls to reach an SSH shell directly hooked on the Internet, e.g. through https proxies. Having access to a bash prompt logged on a direct line on the Internet can be incredibly useful. Leaving the box alive 24/7 allows me to run my own SMTP server. Using services like DynDNS, I can always reach my box by e-mail. This allows me e.g. to send scripts by e-mail and receive their output back (such e-mails are digitally signed). HTTPS proxy with user authentication. This is useful to safely browse the Internet from a non-secure location such as an Internet cafe. Re-direct all your queries to your home https proxy and all your traffic is encrypted. BitTorrent client. Need I say more? The box also comes with a sound board (featuring audio input), which makes it a good candidate for VoIP traffic. Best of all: this box comes with wireless capabilities. It could be used as a HotSpot, or just for wireless connection with my neighborhood e.g. to build a local network. Careful about one point: the unit is currently (June 2007) delivered with a US power supply supporting all voltages and frequencies (110-240V in 50-60 Hz). Trouble is: you cannot adapt the plug easily to European or other plugs. Since the plug is not at the end of a cable but part of the adapter, you really need to convert the flat American plugs to something suitable for you. No big deal but you will have to run through your local dealers to find that kind of traveller’s gadget. Another point: the same unit is marketed under different names by other companies. Searching for eBox-2300 might yield additional pages. The box comes equipped with a Compact/Flash adapter on its front, which makes it the primary support for the OS. I bought a 2Gb Flash for 20 euros, which is cheap enough to be replaced in a couple of years if it wears out. Flash memory is sold for 100,000 to 1 million writes, which should be Ok.
Get access to a Linux box with a USB card reader. During the install phase, the ISO image is seen as a CD and the Compact Flash as hard drive /dev/hda, which is exactly what you want. Perform the install as usual, preferrably a minimal OS version. Install the bootloader on the fake /dev/hda. Once the install is finished, you have an OS ready on your Flash. Insert it into Junior and boot it up. Voila! Of course, the install is performed while in the virtual machine which is very different from Junior. For adaptive OS’s like Debian, this is usually not an issue since all necessary hardware detectors kick in at boot time and re-configure the OS with the appropriate drivers. For Windows-based OS’s it might be more troublesome. Make the stick bootable using syslinux, boot the box from the stick and follow the installation steps. Your Compact Flash should be recognized as an IDE disk (/dev/hda). All necessary files can be retrieved from your closest Debian mirror. memory, this will brick your box instantly believe me. You probably want to activate PNP support and ACPI. Best OS for the task? I have little experience running Windows so I did not try to install any Windows-based OS on Junior, but Nohrtec’s site is full of success stories with older versions used to make lightweight clients like kiosks. Linux comes in many flavours, but once you have tasted Debian you cannot revert back to RPM-based distributions like Fedora, SuSE or Mandriva. I have not tried Ubuntu but Debian works perfectly fine, as I will describe here. load a complete list of supported packages, and then nothing else works. Since the OS stays on a Flash there is no way I am going to setup swap space there. I found out this is really a deep issue for FreeBSD who could hardly cope with memory shortage and died on me several times. The ports collection is really nice but compiling everything from scratch on a Flash does not seem like the best idea either. If I really wanted to run FreeBSD I would take out the Compact Flash, run FreeBSD in a virtual machine to get all packages, compile what is needed and prepare the Flash in one go. Running Debian in these conditions is so much simpler. Junior and let it run on network only. You probably want the unit to power off properly when you press the front power button. This is simply done by installing acpid, a daemon reacting on various hardware events on your box. The default configuration on Debian Etch comes with a single script to do just that. Now when you press the front power button your box shuts down the clean way with /sbin/halt. The g option for Wake-on-LAN (wol) actually specifies that you want the machine to wake up on magic packets (containing its hardware MAC address), but there are other interesting options if you want to wake up on other network events. Check out the ethtool documentation. Make the file executable with chmod +x wol. Now your machine will keep waking up on magic packets. From another machine, use wakeonlan or etherwake to send these magic packets. NB: you can get your MAC address by running ifconfig. I have to say sound quality is just basic, nothing great, nothing bad either. For VoIP applications it should be largely sufficient. The chip is a Via VT6655. It is currently not supported by a native driver under Linux but you can survive with an emulator. They are shown here together with their MD5 signatures to help check out you have the right files. Un-comment the first line (auto wlan0) if you want the wireless interface to be brought up at boot time, otherwise bring it up manually whenever needed with ifup wlan0. The settings provided here make use of DHCP, check out the Debian documentation for a static IP configuration. If the defaults on your network correspond to the defaults for wpa_supplicant, you may probably just specify network name and WPA key. An important point on which I lost several days: the driver for wpa_supplicant should be wext and not ndiswrapper, don’t ask me why. If you brick your box, the only way to unlock it is to reset the BIOS to EEPROM defaults. to remove the bottom part of the box. The upper part stays soldered to the CPU so do not even try to remove it by force. If you examine carefully the top part you should see the battery. You will not be able to get to it, but you can see where it is soldered because there are two plugs coming out on the other side. Short-circuit these two plugs with a paper-clip, keep it for several seconds. Try booting the box again, just plugging in a screen and keyboard, and see if you got it back. If you did not, short-circuit the plugs again for more seconds. Re-build the box when you are done. This page summarizes a wealth of information I gathered from the Web on various places. This is merely a compilation of various contributors, let them all be thanked for their invaluable help! A special mention to Nohrtec for their incredible support. These guys know what service and dedication to their customers mean. A million thanks! You will find me on this group, together with many other people far more knowledgeable than myself on the MicroClient topic. Come join the fun! Thank you so much for this posting! I just bought a Microclient Jr myself and was dissatisfied with Damn Small Linux as pre-installed on the CF card I got with it. With your help I was able to install Debian and get a minimal system set up. I’ll be installing this client later this week at a friend’s bar/club/gallery, where it will power an electronic anonymous “confession board.” I’ll be sure to write it up and send you a link. Also want to relay my thanks for publishing this. Spent most of the afternoon following your instructions and my Microclient (that’s been sitting on a shelf for 9 months because Puppy was completely useless) has usurped my slug (Linksys NSLU2) as the heart of my home network. The increased performance is very noticable even on tasks as mundane as rsync. May I add my thanks for this article. I have been trying to get the wireless to work with puppy linux but haven’t had much luck. I will try your approach – but first I have to know where do I put the three driver files before using ndswrapper. As you might suspect, I am an absolute newcomer to Linux and need to be lead by the hand and with baby steps to get anything done. Can you help? I appreciate all the help I can get! About driver files for ndiswrapper: put them anywhere you want, e.g. in a temporary directory. Once you have registered the driver with ndiswrapper, these files are copied over under /etc so you can safely delete the initial files or archive them. I am not really an expert on ndiswrapper though, you may want to try your luck on ndiswrapper forums. Do you have a benchmark of your micro client. I am very interesting in this kind of Green Pc but I need a benchamrk to known what I can do with it. Sure. What kind of benchmark are you thinking about? If you could suggest a list I would be ready to try out and give you some figures. To give you an idea, my current configuration is: system completely loaded onto an integrated Compact Flash and home directories on an external USB drive, so any test related to I/O measurements will perform like flash memory and USB1 access. As for CPU or network measurements, you get exactly what you expect from a 200MHz CPU an a 100Mbit NIC: nothing top speed but good enough for most network-related tasks. I followed your instructions with qemu. I have used Puppy Linux to boot my PC, ,mount debian ISO as boot CD and CF as hda. Install with Debian to CF went fine (first time I got problems with gparted), but after trying to boot microcleint from CF nothing happened. Looked into CF and it was empty. What I did wrong? Debian installation went fine (no errors). I cannot remember whether gparted made swap partiotion on CF, but is that ok? Also grub is installed to the CF is that ok? Regarding to debian and CF, what is the frequency that debian is writing to the CF? Writing very freqeuntly to the CF seems to me not to be a good idea. Something went wrong with your CF install, obviously. You should end up with real filesystems on the CF card, which can be mounted on your desktop machine with a card reader. You may want to look into the Linux live-CD you booted to see if it has all necessary rights to write to a CF card? About intensive writes to the flash memory: from what I can see Debian is really not intensive, but this will be highly dependent on the applications you run. I have a web proxy running on Junior now, with all data files (/var) on a mounted external USB disk to avoid thrashing the flash. The rest of the OS sits on the CF card. I would not care too much about that anyway: flash memories have now integrated algorithms to spread the load to the whole available surface to avoid concentrate all accesses to the same region. My CF card was sold for a million writes, I am pretty sure Junior will be outdated far before the card is overused. FATAL: Module sis7019 not found. I’m trying to get soundcard to work, but I don’t know how to proceed, can you describe it step by step? Thank you!! Is it fast enought to run an X session at least with icewm or xface? Yes, Junior is fast enough to run an X session. It may be slow by today’s standards but I remember running RedHat with KDE on a 200MHz PC not so long ago and it worked fine! To be honest: performance compared to today’s desktops is disappointing. Forget about browsing the web with Firefox, 128 Mb of RAM are not enough. You may want to try Norhtec’s MicroClient Senior, which sports a 500MHz CPU and 512Mb RAM, it should be much more comfortable as a desktop replacement. I have ordered one myself and will report on it here. Please help me solve out this error. Am getting late for my thesis. Seems that your DHCP server is not responding. You may want to check with your system administrator about your MAC address being registered as official host for the DHCP server on the local network first. Can I run NAS on this with external HDD connected? You should be able to run NAS on a MicroClient Jr.
Network support is excellent, and external HDDs are supported. Beware though, it only runs USB 1.1 which does not give much bandwidth. Thanks for the response. Is there any other micro client that would do the USB 2.0 that you are aware of? Hey thanks for this information… I have a problem though that maybe you or someone who reads this can help me with. I installed debian etch from netinst on a CF card by way of qemu. Debian runs without issue under qemu. However, when I boot the CF on the microclient jr., grub loads but debian does not. The Jr. just reboots ad infinitum. Any idea why that would be? Just an idea: there might be an inconsistency between the device names associated to your CF card between the virtual machine and the MicroClient, like /dev/sda on one and /dev/hda on the other. You need both to be seen as the same devices for the magic to work. Another idea would be to use disk UUIDs instead of device names to be really independent from device names. If this is really the case, you should be able to correct it by mending your /boot/grub/menu.lst and re-running grub on the CF. Iv’e tried this installation procedure on the MicroClient Sr and it worked perfectly! Before that I got convinced to try openSUSE but it failed at a point where it needed to update ‘mounting point / in /etc/cryptotab’, but I just used ext3 file system and no crypto. I ment: I installed without swap disk ..
Is it possible to boot the MicroClient automatically at power on. Tor: yes you can run Debian without swap disk. It is not recommended but so far Junior has been running without swap for over a year and never showed any sign of bad behaviour because of it. scostic: the MicroClient automatically boots at power on. There is also a BIOS option about what to do when power is cut: boot again, stay down, or keep state as it was before power went down. I was wondering: There must be many that has installed Debian on JR using CF cards. there must be many (like me) who aren´t so Linux skilled, to write the right commands. Who has a link to the CF Image? Jesper: Unfortunately, there is no equivalent of Ghost on Linux filesystems. You can make a bit-by-bit image of a hard disk or CF card but if will only work if you dump that image onto another media that has exactly the same physical characteristics. You really need to create the filesystem using the appropriate tools, then populate it with OS files, then install a boot loader on the adequate boot sector. I could make a disk dump of my 2Gb CF card but this would create a bulky hardly downloadable 2Gb file, and would only be usable on 2Gb cards that are sufficiently similar to mine. Better download the ISO image (<600Mb) for Debian and install using a USB drive. There are many tutorials on the Net about how to install Debian from USB stick to hard disk or CF card. None of them are hard to follow, including the install instructions published at debian.org (and referenced here in this blog). I just ordered a MicroClient Sr with 1GB RAM and WiFi. Your notes will be very helpful when it arrives. That version (1.17, source-only) claims to support 2.6 kernels and WPA/WPA2. There’s an older version (1.06) on the Norhtec web site, but that one says it only works with 2.4 kernels (or 2.6 with ndiswrapper). Of course I haven’t tried any of this yet, but thought you might be interested. Do you think it’ll work? I wrote an article on the Microclient JRSX. located here http://bluegreenyellow.com/microclient/ This article was a great help. This was a first for me, an installation on a disk less machine. How did you get the LAN drivers to work? I couldn’t get debian to recognize which driver it should use. Did not do anything specific. Just loaded up the OS and it worked. Apparently the drivers are 8139too and 8139cp. Make sure your Debian version includes these? 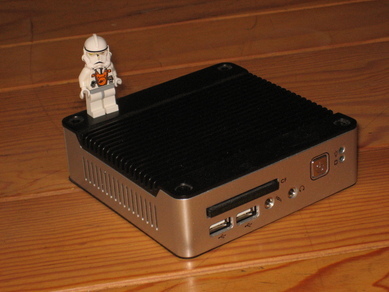 Hi, I am interested in buying the Microclient Jr too but I didn’t read good things about the VorteX86SX (also known as the SiS550) performance so I can’t decide between that and some other AMD geode-based mini PCs. If you had some spare time could you please try running the LMBench benchmark suite (it’s available in the official debian packages repositories) and post the results? Thanks! Thanks for the benchmark results. From comparisons I could make with other lmbench results the hardware seems to be about as fast as a 400mhz pentium 2, providing the results are the same between lmbench 3 and 2. It’s not bad at all, I was expecting the results to be much worse because of the lack of L2 cache. Now I found out that DMP released a newer Vortex86 clocked at 1ghz and with L2 cache (Vortex86DX) and that Norhtec is selling 2 mini PCs based on it, one named MicroClient Jr Dx (140$) that looks just like yours and another one that is entirely housed inside a tiny touchscreen monitor called the Touche Panel PC (400$). Can’t wait to put my hands on one of those! Thanks for this article. That is really interesting. By now I booted my Microclient Jr to DOS on and played Wolfstein 3D. That is really cool! I plan to set up my device to play icecast online radio. Not sure what OS to chose though. In any way, food luck! DOS and Wolfenstein were cool during the glorious 386 era, MicroClients have a lot more to offer! Go ahead and install Linux, you won’t regret it. If you could cope with MS Visual Studio you should not have any issue with the relative simplicity and logic of a Unix install. Welcome to Unix! Thanks for the great info. I used it to set the wireless card, which previously was very frustrating. A second microclient I received from a customer had failed wireless connectivity, and I also used your instructions about disassembly to discover that the cable to the antenna connector had become disconnected from the board. I finally set up Debian Lenny on the MicroClient (ebox2300). Not sure how slower it runs in compare with Debian Etch. In case of Lenny the only thing I needed to setup audio was “aptitude install alsa-utils”. MPG321 player plays mp3 with 25% of cpu. Lenny takes 500 Megs of disk space. Thanks again for this article, Nicolas. Troubleshooting section is very confusing. To reset CMOS to get BIOS defaults, you do not need to open the box but you need a PS/2 keyboard & press the END key to achieve the same. I think by trying to short-circuit batter leads, we loose battery charge. The above worked for me today but not the battery lead short-circuit. hey. thanks for the “debricking” advice – i made the mistake of setting the video settings incorrectly. weird how it doesn’t have a jumper for a reset though. again, many thanks. also, does anybody know about the watchdog timer on these? anybody know which modules to load? Nice to see the debricking advice could be useful to somebody else! I’ve recompiled OpenWrt 10.03 x86 to boot from this device.